Duff McKagan has left Jane's Addiction after just six months. The news came rather quietly yesterday in an e-mail statement from the band, who stated that they were no longer working with the ex-Guns N' Roses (and we would still assume current Velvet Revolver) bassist. "Hey we wanted to thank Duff for helping us write songs for our new record," said the e-mail. "We love the songs we worked on with him - and the gigs were a blast - but musically we were all headed in different directions. From here Duff is off to work on his own stuff so we wish him all the best." The same day, Jane's frontman Perry Farrell, posted well wishes to McKagan on his Twitter account: "Jane's wishes Duff much luck with his band Loaded. What a fun time we all had working together. Look out for his record and tour this fall." Earlier this year, McKagan hooked up with Jane's because he needed to occupy himself while Velvet Revolver continued its seemingly endless search for a new singer. In an interview with Seattle Weekly in April, McKagan said, "Velvet is in a period of downtime right now, and perhaps we will one day get a new singer. For now, though, I have to look at opportunities when they are presented." The Jane's-McKagan match seemed to be a good fit...at the time. In an exclusive interview with MusicRadar, drummer Stephen Perkins enthused about working with the bassist: "He's one of us now...He's definitely here for us when we need him, no question. He gets in the room with us and works out songs, then he takes tapes home - he's there. He's been a nice shot of vitamin B." 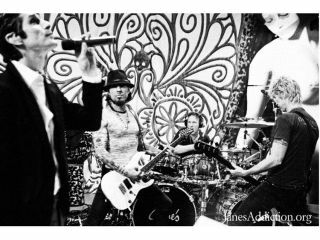 McKagan's band Loaded has finished recording their third album, which will likely appear before a new Jane's Addiction record, to say nothing of Velvet Revolver.